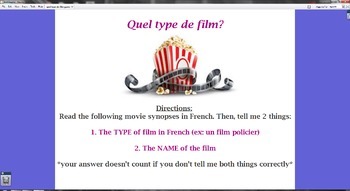 This flipchart game is used with dry-erase boards to practice film genres in French. It was created based on Chapter 12 of the Bon Voyage, Level One, French series. 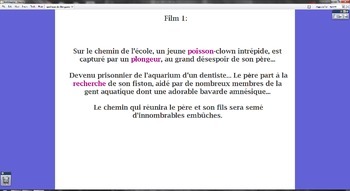 Game premise: On one slide, I describe a popular film in French. 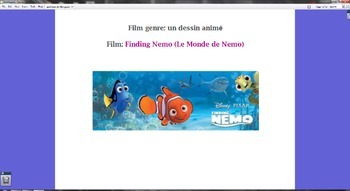 Then, students must guess on their dry-erase boards the title of the film (in English) and the genre of the film (in French). Students used their vocabulary lists to complete this activity. However, I have listed the film genres that are used in the game on page 2 of the flipchart for those of you who want to use this activity without the Bon Voyage vocab lists.